Fashion designers demolish stereotypes and prove to us the opposite – two is good, but one is still better. 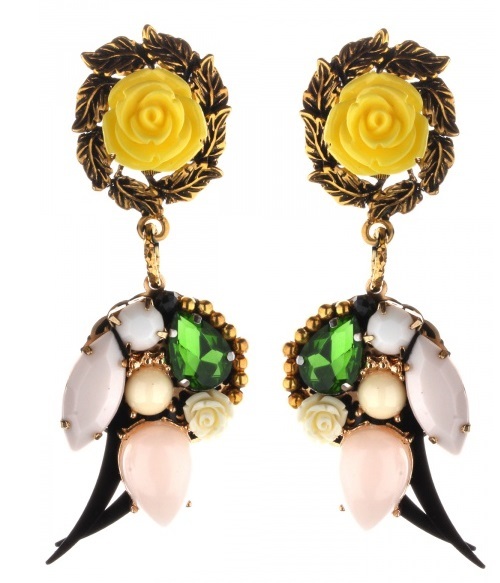 If an earring looks like a work of art, it doesn’t need pair and will look harmonious one. 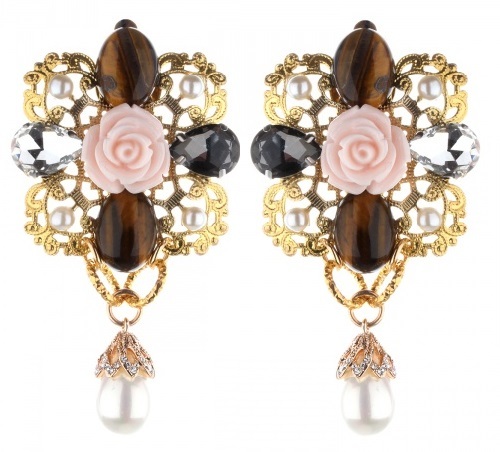 Especially mono earring from the collection of Georgy Rushev “Flora” with pearls and rhinestones, Swarovski crystals, decorated with images of an eye. 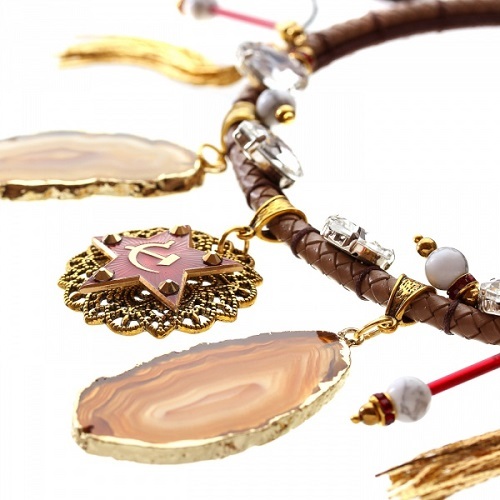 Each new collection – is a mini series creation of semi-precious stones – amethyst, noble shine of citrine, depth of garnets, alluring shade of pyrite and rhodonite, combined with metal, plastic, glass beads and crystals. 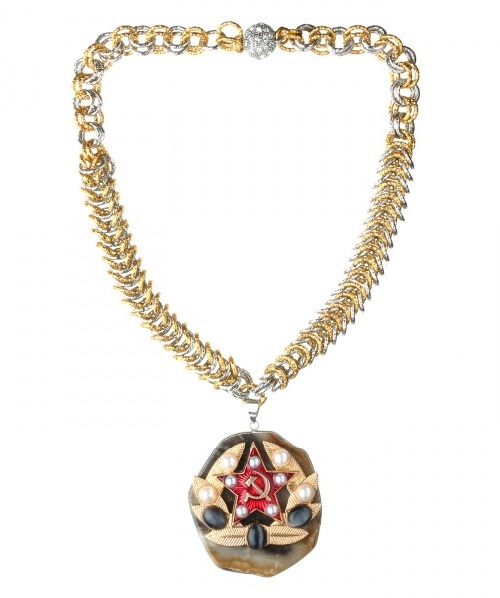 Jewelry from the new collection of Georgy Rushev “Flora” designed to revive the tradition of luxury and elegance of distant 20s. 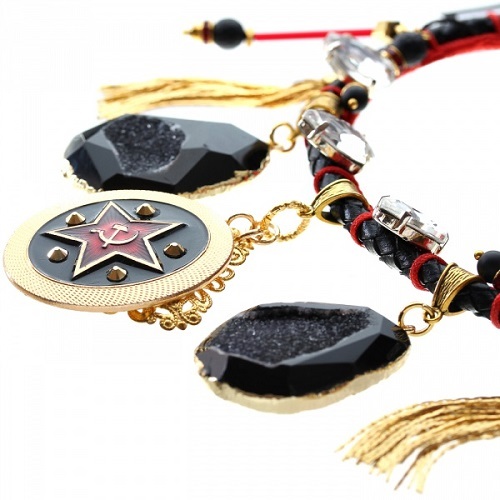 Georgy Rushev jewellery collection “Patriot” is quite controversial: some support the protest against the sanctions, and the designer is actively destroying the stereotypes of fashion, with humor and understanding of how best to wear it. 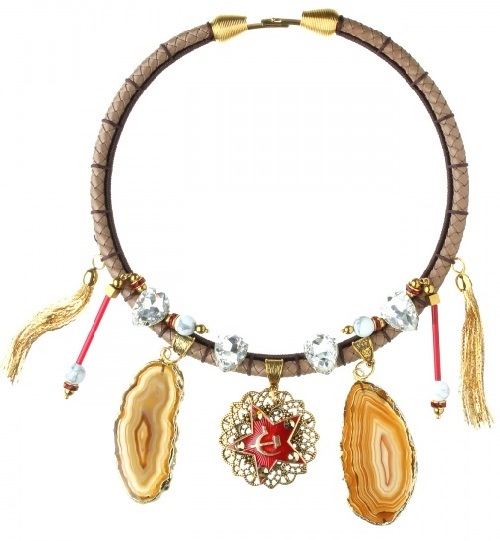 A necklace with a massive pendant of Moonstone and Swarovski crystals on a leather cord should not be worn in conjunction with the “luxury” and “bohemian” image. The best option would be a classic black or white dress with a plunging neckline. 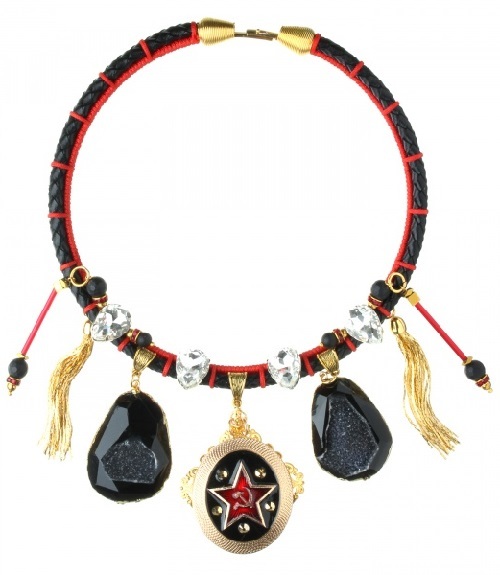 Unusual necklace from the new capsule collection of Georgy Rushev “Patriot” is inspired by the aesthetics of the Soviet Union. This kind of response of the designer on sanctions and political games of the leading world powers, provoking a surge of attention to the traditional grounds of national culture and history. 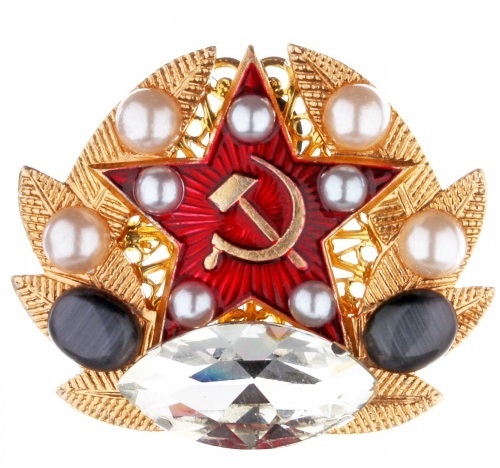 A new interpretation of the iconic symbol reflected in the shocking decoration depicting a red star, hammer and sickle. 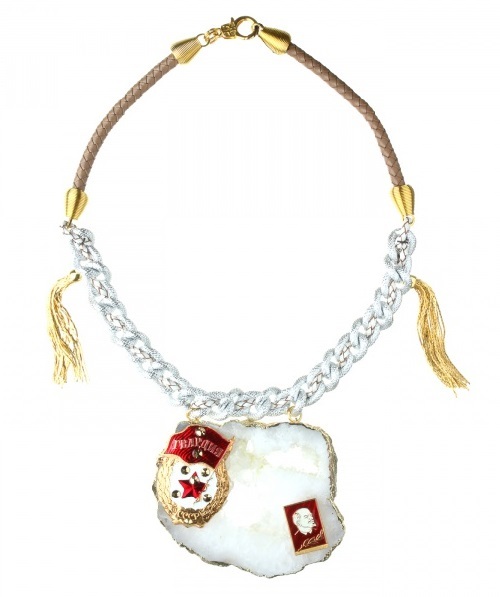 Author’s work is made entirely by hand from natural materials and stones. 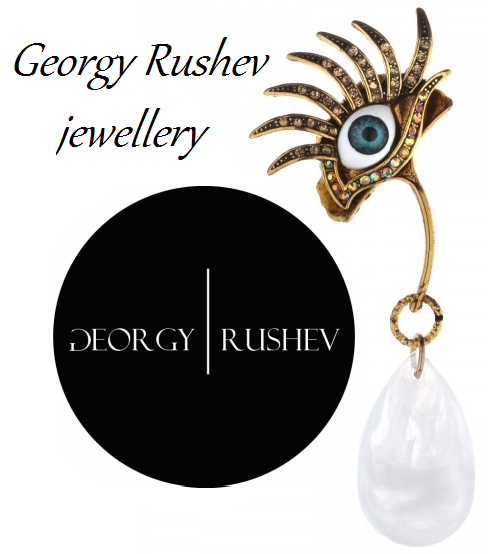 Georgy Rushev jewellery is 7 years old and during that time, much has happened: collaboration with renowned designers (Alena Akhmadullina, BEssARION), glossy magazines, the recognition of colleagues – Evelina Khromchenko, Aidan Salakhova, Alyona Ahmadulina. 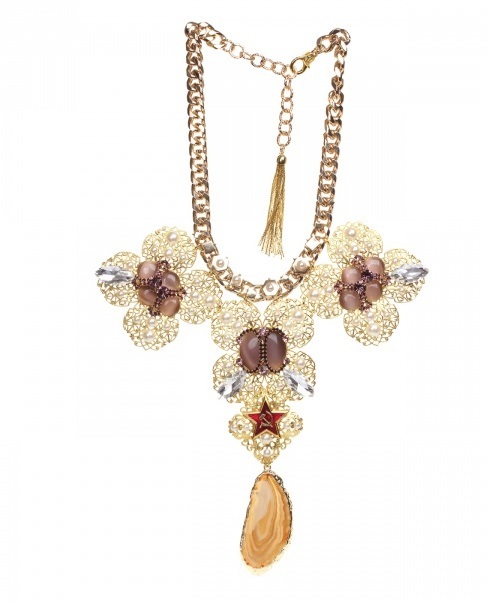 Each ornament – an emotional reinterpretation of fashion trends and sensual, even fabulous images. 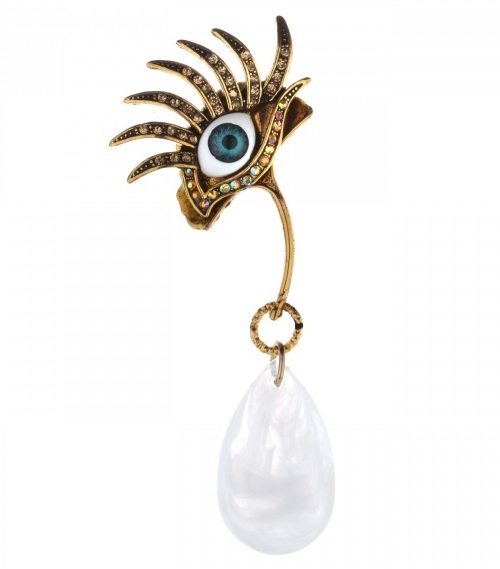 Before the creation of accessories Georgy Rushev had to work as a window dresser, stylist and art director for glossy magazines, while studying the history of fashion. He tried to remember nothing about the practice, nor about the theory. And then tried his hand as a designer – decided to turn his passion for crafts into something more global. His first collection was published in 2008 and its foundations were hats. 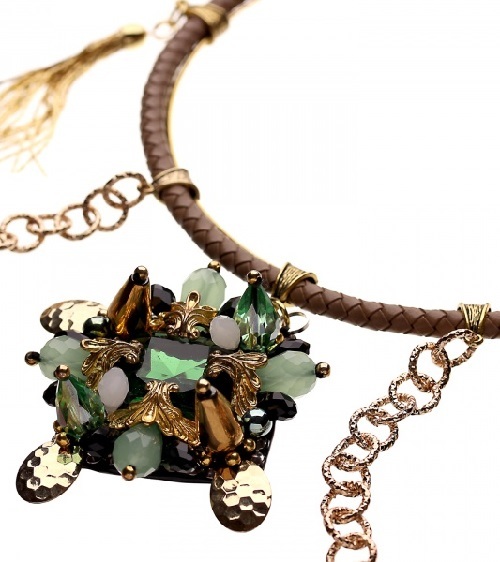 Jewellery and accessories is his connection to the world, showing trends and art that is very interesting to him. The basis of jewelry art by Georgy Rushev – XVIII-XIX century, Baroque, Romanticism. 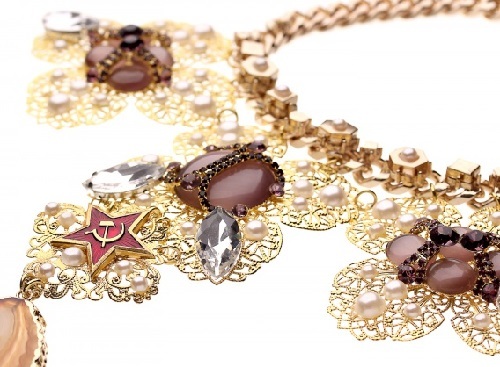 The creation of each necklace begins with associations, something from history, for each collection is a certain search. The creation, manufacturing process and technology is a long process that requires hard work. It begins with inspiration. The inspiration can be anything. 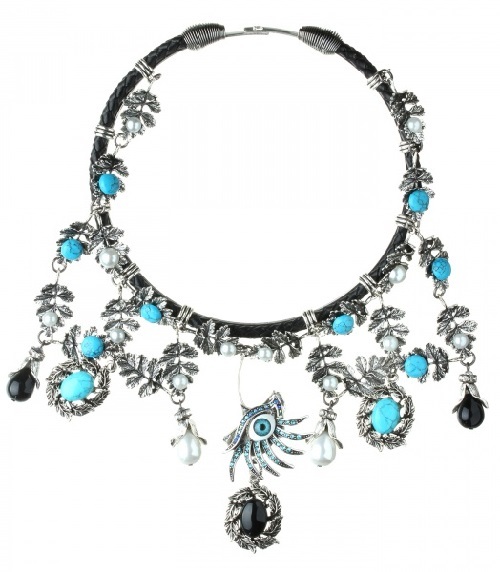 “I like to meet interesting people, learn the ancient nations and their costumes”, says the jeweler. 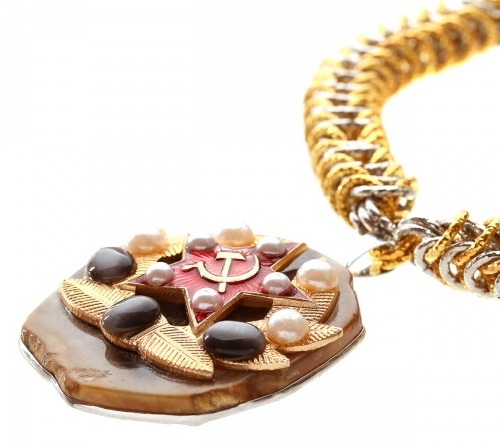 Massive decorations by Georgy Rushev are made of metal, treated in different techniques and materials such as rubber and plastic, precious stones – amethyst, garnets, citrine, pyrite and rhodonite. “The inspiration can be anything. I like to meet interesting people, learn the ancient nations and their costumes. For Georgy Rushev ideal of a woman is Dita Von Teese, with her exaggerated femininity, combined with incredible strength. 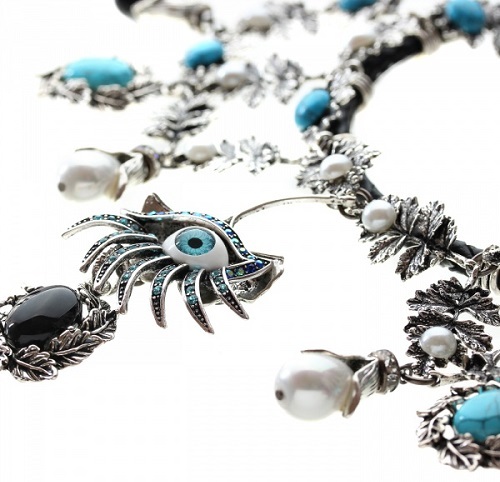 Daphne Guinness – not just a talented woman, but a real art object. Woman with high intelligence, sense of style, natural beauty and incredible charm. Jewelry from the new collection of Georgy Rushev “Flora” designed to revive the tradition of luxury and elegance of distant 20s. 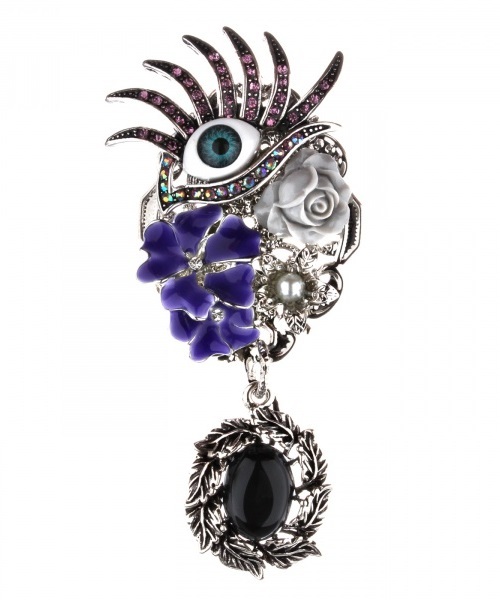 For example, this brooch-pendant with black agate, enamel, pearls and Swarovski crystals is ideal for vintage dresses and shawls (even tied like a turban), and a white shirt, T-shirt and jeans jacket.